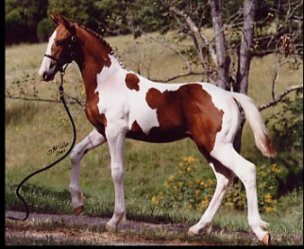 This foal is Nico all over again, only chestnut and white. Flashy, fantastic disposition, extraordinary movement and suspension, very uphill. Mighty was high-scoring (75%) and a big hit with judges in Raleigh, NC as shown by comments such as "impressive manners, presence, nice big strides." 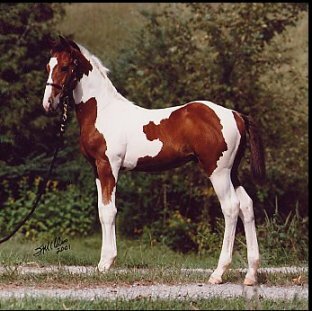 Gorgeous foal; rich color; regal expression; beautifully mannered; bold, brilliant mover; high scores in Raleigh, NC; wonderful prospect! Exquisite filly! Born 9/11/01, our little bit of sunshine...on a sad day. Song has a beautiful head, Friesian expressions, big fancy mover, very athletic, well mannered, and excellent conformation. 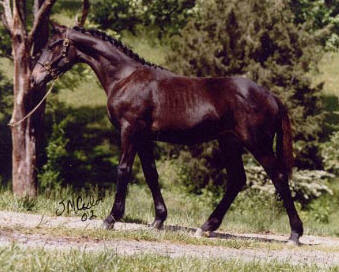 This filly is a fabulous dressage prospect! Knock-out *Nico/Arab cross! She was placed 2nd in the Half-Arab class of the Music City Arabian Horse Show in Shelbyville, TN. Take a look at me!